World Solar Challenge Great excitement on day 2 of the 2011 World Solar Challenge - a bush fire halted the 3000km race across Australia for several hours. 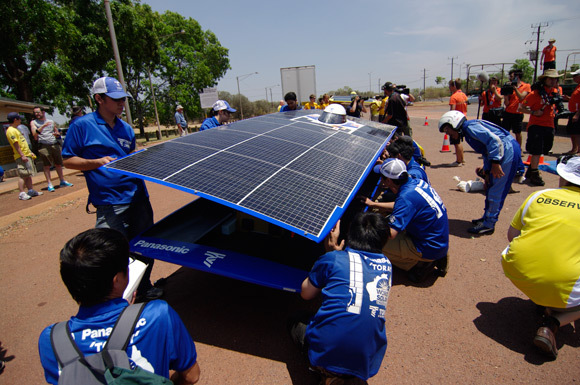 The leading pack of solarcars, Tokai, Nuon and Michigan, were holed up early afternoon at a roadhouse called Wauchope, about 1100km south of Darwin, after police shut the road. The bush fire, "worse than usual", according to the jovial policeman who directed us to the roadhouse, was nearly 100km south. But nowhere else was suitable to stop between here, he told us. Two hours later, at 3.30pm, the road was open again to vehicles travelling south. But the contestants stayed put. There just wasn't enough time under the rules - all teams are to stop racing by 5pm - to find a decent place to camp for the night. 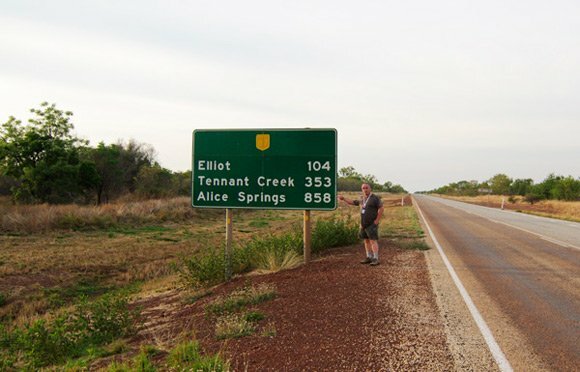 Lester and I were under no such constraints and we dashed the 400km south to Alice Springs, having started the day some 850km north of Australia's biggest outback town. We were determined to get there before dark and without hitting wandering cattle. We could see that the teams were right to stay at Wauchope. Down the track, some 90km south, we encountered smoke, smouldering bush and several small fires. Nearby at Barrows Creek, a roadhouse and checkpoint for the World Solar Challenge, a fire seemed perilously close to a petrol forecourt. Beyond, the bush was scorched for several kilometres, although, as we are untutored in such matters, we could not tell if this was the result of today's fire or evidence of earlier conflagrations. So, we find ourselves a long way ahead of the race leaders. A chasing second pack of five teams are, on the advice of the police, all camping out tonight at Tennant Creek, about 100km north of Waukhope. 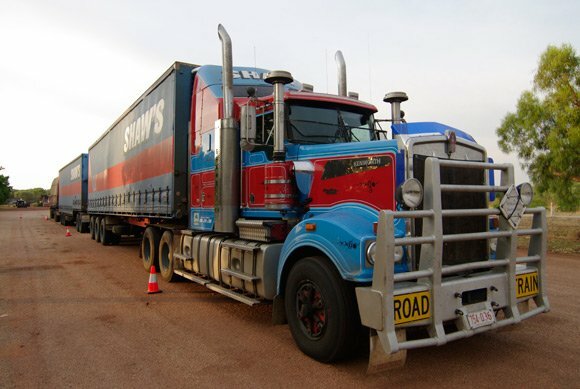 ... drivers have to deal with fatter monsters, outsize trailers carrying enormous mining trucks that take up more than half the road. We came across a couple today, driving in the opposite direction. We moved off the road. It is not so easy, for solarcars. 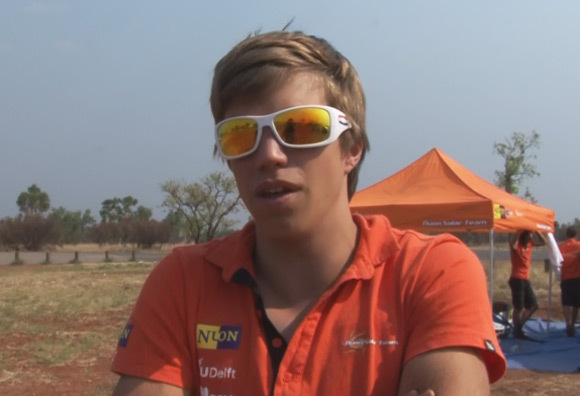 Bruno Moorthamers (pictured, below), a driver for Nuon, explains. Bruno told us of his encounter with the monster truck convoy and their warning vehicles. His support vehicles drove on to the side of road, but solarcar steering didn't allow him that option. Instead he had to carry on, a "little under" the giant trailers. Bruno also noted the challenge of driving in crosswinds of 38km an hour. Nuon prides itself on the aerodynamic stability of the car, which they think is the best in the field. But even this car, and the others we have seen in action, are moved sideways by the wind. And Bruno's other comment on his solarcar drive, his first on the public highway? "It was great, actually," he said. 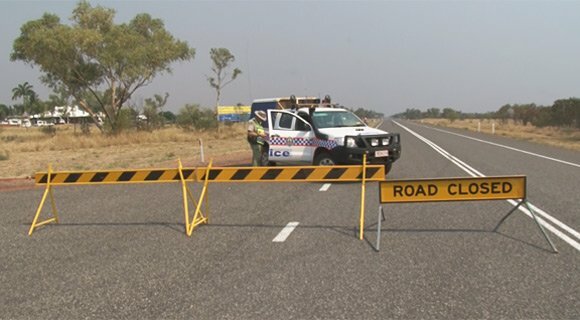 Our last thoughts on today was the checkpoint at Tennant Creek. We were particularly impressed with the slickness of Tokai Uni team in their changeover - as fast as an F1 pitstop team, we thought. So here is a pic of the guys in action. Tomorrow, day three, we will meander to Coober Pedy, with a view to prospecting Woomera as a site for our own LOHAN project. We aim to connect with the leading pack by the end of the day and will try to update you then.